COLOR(S):White with patches of gray, black, sandy, or chocolate. The Polish Lowland Sheepdogs are medium-sized, strong, muscular, shaggy dogs with a long coat that covers their eyes and body. They may be born without a tail or their tail is docked at birth. Their willingness to please and devotion to their family make them great companions while at the same time a superb watchdog always on the alert for strangers. A Polish Lowland Sheepdog\'s amusing ways and floppy bodies make them highly lovable. They excel at almost any task they choose to undertake and are highly adaptable and suitable to almost any lifestyle. However, the breed has been known to get into mischief if left in the house alone too long. They can be stubborn and are a very independent breed. They are lively, intelligent and affectionate. They are known to have an exceptionally good memory for a dog - some remembering favors or offenses years after they have happened. The PON has eyes that are said to be "penetrating", and their lovable attitudes make them an ideal choice for the owner with a family. 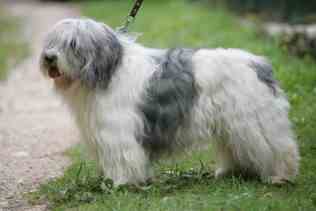 Polish Lowland Sheepdogs are lively but not to excess, perceptive, highly intelligent and affectionate. They are graced with an excellent memory, sometimes remembering actions from years before. They are wary with strangers, stubborn and independent minded, but friendly and lovable to their family. They are devoted dogs. They are trainable, though it may be more difficult for this breed. Polish Lowland Sheepdogs are very alert and will defend their family to any extent. They get along well with children, and are protective of them. They also do well with other pets as long as they are socialized. They are a clever breed. Their long coat requires 30 minutes or more of brushing one to two times a week with a pin brush/comb to keep the coat from matting. Never brush the coat when dry or use a slicker as this damages the coat/undercoat. Teeth, ears and nails must be tended to weekly. Most Polish Lowland Sheepdogs prefer some daily exercise and many will thrive on as much exercise as you are willing to give them.